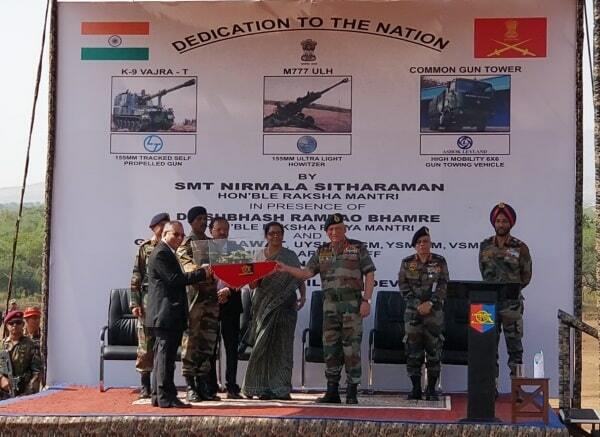 Marking a major milestone towards capacity building and capability enhancement of the Indian Army, Smt Nirmala Sitharaman, Honorable Defence Minister, today dedicated the globally combat proven M777 A2 Ultra Light Howitzers, K-9 Vajra-Tracked Self Propelled Guns and 6x6 Field Artillery Tractors to the service of the Nation. The Dedication Ceremony was held at Devlali Field Firing Ranges and was attended by Honorable Raksha Rajya Mantri, Dr Subhash Ram Rao Bhamre, General Bipin Rawat, Chief of Army Staff, Senior Serving Officers of the Indian Army and Ministry of Defence, representatives of Manufacturing Industries as also dignitaries from the Government of USA and South Korea. The 155mm, 39 Calibre Ultra light Howitzers have been procured from the USA under Government to Government Foreign Military Sales and will be assembled in India by BAE Systems in partnership with Mahindra Defence. The Gun System is versatile, lightweight and can be heli lifted, thereby providing the much-needed flexibility in employment in various terrains obtainable in the country. The Howitzer is in service in the US, Canadian, Australian and Some other armies of the world. It has proven its mettle in difficult going areas of Afghanistan and Iraq. The first ten K9 Vajra 155mm/52 caliber guns have been imported from Hanwha Techwin of South Korea in Semi Knocked Downstate and have been assembled by L&T in India. The balance 90 Guns will be largely manufactured in India with some major assemblies coming from South Korea. Its induction will give a huge fillip to the firepower capability of Indian Army on our western borders. The 6x6 Field Artillery Tractor has been indigenously developed by Ashok Leyland and will provide the much-awaited replacement for the aging fleet of Artillery Gun Towing Vehicles. Dedication of this equipment to the Nation also give a major impetus to ‘Make In India’ initiative of the Government. The event included an impressive display of equipment and firepower by the Guns of the Indian Artillery. Also on display were indigenous Gun Systems/Surveillance & Target Acquisition Systems that have been recently introduced in service.